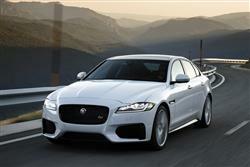 Find out everything you need to know on the new Jaguar Xf from independent vehicle review website Car And Driving. You can watch the video review to the left to see more of the car or read their written review below to get a true insight from an expert in the automotive industry. The Jaguar XF has evolved and improved, now offering a class-leading package that includes the brand's Ingenium diesel engines and AWD. Jonathan Crouch takes a look at the latest version. Light, spacious, good looking and efficient, this car will worry rival German makers more than any model Jaguar has brought us so far. Are there issues? A few. The range of variants on offer still isn't as wide as you'll find elsewhere. And we wonder what effect this car will have on sales of its smaller XE stablemate, given that volume versions of the two models are so similarly priced. Ultimately though, what's so masterful about this second generation XF is how cleverly Jaguar has kept and built upon what was good about the original model, while being realistic about where the old car's weaknesses were. As a result, you now really can have a beautiful Executive class car that offers cutting-edge technology and a dynamic driving experience but which is also built in Britain and sips fuel like a supermini. These truly are amazing times.